Filmed ten years after the Cuban Revolution, Landau’s landmark documentary is still as interesting, powerful, and relevant in our contemporary world as it was then. Following Fidel Castro, exploring his politics, person and philosophies, this film is for those with an interest in getting a glimpse at what made and perhaps makes the larger than life historical figure tick. Fidel is shown realistically; his dirty fingernails, penchant for professorial lecturing, and joyfully mischievous eyes all come through quite starkly thanks to Landau’s engagement with his subject. Remarking that he must always be “in constant relation with events, problems, and people,” the Cuban leader is followed from village to village, event to event, as he makes an effort to imbibe the concerns of every day Cubans. The leader is also very revealing, speaking on how at that time, Cuba lacked artistic creation, trained scientists and capable technicians. While both Fidel the man as well as Fidel the leader are represented, many times it’s plain to see the private and public personas are one and the same. Observing that “politics had to be developed” after the initial revolution, Fidel makes it clear that for the movement to continue to succeed, it must be made from a position of governmental power. Reflecting on how Havana gave the illusion of development, like all capitals of underdeveloped countries, Fidel observes, “underdevelopment is also a psychological problem” as well as an economic, technical, and cultural challenge. Landau portrays Fidel’s efforts to change this, by modernizing the country with collective farms, roads built, and hydroelectric dams installed to harness the power of Cuba. These actions are meant to destroy the inhibitors by creating confidence in the then new economic reorganization of the country. This crisis of confidence in economic organization, this psychological problem of underdevelopment, rings true once again 40 years later but perhaps now in a North American context. 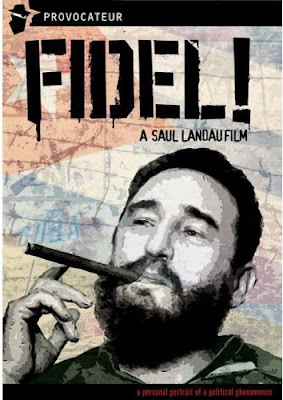 Severing diplomatic ties in 1961, invading later that year, and finally placing a crippling economic embargo upon Cuba in 1962, the United States now finds itself on the precipice of normalizing relations with Cuba, making Landau’s film even more poignant today.